Ravello has, as do many important ancient military cities, two fortresses. The first bastion was on a promontory and was situated in the lower part of the city. The second was higher up, and served as the last line of defence. Today these two bastions stand resolute, maintaining their original names respectively: Torello, the distinctive hamlet at the feet of Ravello, and Toro which is currently where the Town Hall now resides. The village of Torello was built up on the mountain slopes, where at the time stood the Church of St. George of Pendula. There have been two invasions of Torello, the first by the Normans in 1131 and the second by the Pisani in 1137. It is important to note that in the XII century, the Seafaring Republics, Amalfi, Pisa, Genoa and Venice all fought or formed alliances between themselves according to timely political or economic interest, to begin trading goods with the East. History tells us that a fleet of Pisani, who were the most powerful in the Tyrrhenian sea, were ordered to attack Naples because King Ruggero II had placed the city under siege, as it was the last Romanesque-Byzantine defence in the Campania region. King Ruggero II expecting the attack on Naples commanded all the fleets there, leaving Amalfi undefended. The Pisani knew of the King's plan and with a fleet of 46 galleons, sailed towards Amalfi for two reasons: one, to end its war with Amalfi for commerce with the East, the second, to gain control of the beloved city of King Ruggero II. So on the morning of the 6th August 1135, the Pisani appeared on the horizon of Amalfi, which had almost no protection. The Pisani managed to trick the few remaining guardians left in the city to head southbound towards Salerno. And soon, the Amalfitani soldiers moved in the same direction, thus leaving the city completely undefended. The Pisani, with their unexpected change of direction, entered the port of Amalfi without any resistance and took control. They began their pillage of Amalfi and of the nearby villages until they arrived in Ravello, where they were stopped by the fortification of Fratta, built a few years prior by King Ruggero II on the hill of Brusara, which helped shelter the remaining soldiers of Ravello, Scala and Amalfi. The King, having heard the news of these attacks, sent an army of around 7000 men and 60 ships, surprising the Pisani and causing a heavy and memorable defeat upon them. The total loss of Pisani (dead and those taken as prisoners) was said to have been around 1500 soldiers. Two years later, a strong Pisani fleet of 100 galleons and 80 ships from the Republic of Genoa (with whom they were allied) returned in order to revenge the shameful defeat they had endured on their last voyage. On the 13th of July 1137 they disembarked in Maiori and, after having overtaken the defensive barrier of Minori, they attacked Ravello, who once again stood firm to their enemy with courageous resistance. The first bastion, Torello, underwent three days of pillage by the Pisani and was eventually set on fire. It slowed down the Pisani's progress and gave the rest of Ravellesi soldiers time to shelter themselves in the Toro and prepare for battle. They were able to resist over a long period of time, but the Pisani this time proved too strong and the Ravellesi finally succumbed. This battle demonstrated just how important Ravello was as a military city, not only because of the tremendous honour and courage that they have fought with but also because other cities of the Duchy surrendered, paying the Pisani and the Genovese large sums of money to avoid the destruction of their cities, instead of fighting. 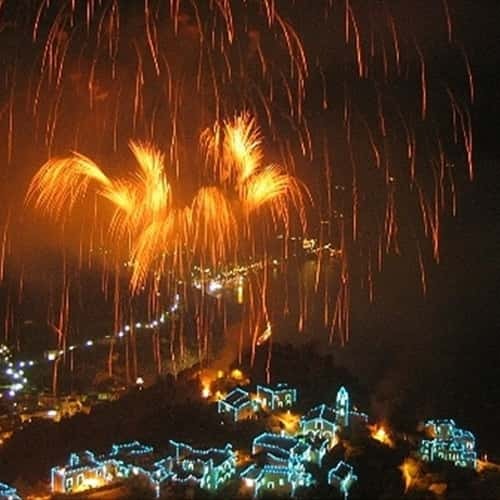 Every year the city of Ravello will reconstruct, with an imaginative pyrotechnic reconstruction, the first invasion of the Pisani. All the houses of the hamlet will be illuminated by lights that will change in colour to emphasize the sequence of historical events. The lights and the fireworks will congregate from the four angles of the village to pantomime and represent four events: the battle, the fire, the pillage until the defeat and the driving out of the Pisani respectively.